On Monday, September 18, USES hosted a community meeting to share our renewed model and theory of change, provide updates on the Vision125 strategic planning implementation, and discuss our goals for utilizing real estate in the South End. USES’s renewed mission is to harness the power of our diverse community to disrupt the cycle of poverty for children and their families. As President & CEO Maicharia Weir Lytle said, “Throughout our history, everything that USES has achieved has been due to the incredible network of neighbors in the South End who are willing to give their time, skills, and resources to create an inclusive community where all families can thrive.” We believe that as families stabilize, become more resilient, and connect to a diverse network, they and their children are more likely to develop the skills they need to succeed. To achieve its vision, USES is in the process of engaging consultants from Utile and Traggorth Companies to explore USES’s options for aligning its real estate portfolio to meet programmatic needs and support a sustainable business model through revenue generation. Architect Mimi Love shared that the three goals guiding this process are consolidating under one roof to best provide whole family programming, creating flexible space that allows for growth, and generating income through program growth, earned revenue, and funds to replenish the organization’s endowment. Weir Lytle shared that the organization is also conducting a fundraising feasibility study to set a goal for an ambitious five year campaign that will include growth capital, bricks and mortar, and annual operations. To learn more about how you can get involved, or to ask specific questions about USES’s next steps, email vision125@uses.org. 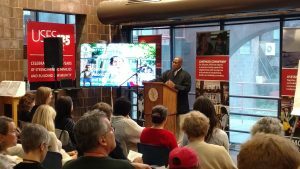 You can also learn more about Vision125 in this article reporting on the community meeting, published by The Boston Sun. Click here and join a community of neighbors helping neighbors. Design/Develop: Dylan Stewart, Nadine Zein, Pooja Matta.